The 100 begins to wrap up its fifth season with the Wonkru attack on Shallow Valley led by Octavia and some pays off some of the animosity that has been building all season. Octavia has undoubtedly been the focus of this season with the plot moving forward because of decisions she makes and much of the conflict stemming from reacting to her behaviour. It gives the season focus and allows The 100 to remain character driven but in a different way. As is common on this show the exploration of Octavia as a leader in this season is rooted in complicated moral questions that many of the other characters have an opinion on. The decisions she has made have also been presented to the audience in a factual way to allow viewers to make up their mind on what they think is the right thing to do while Octavia and the others navigate a morally grey landscape. This episode begins the culmination of everything the season has been building to with Wonkru’s ill advised attack on Shallow Valley. 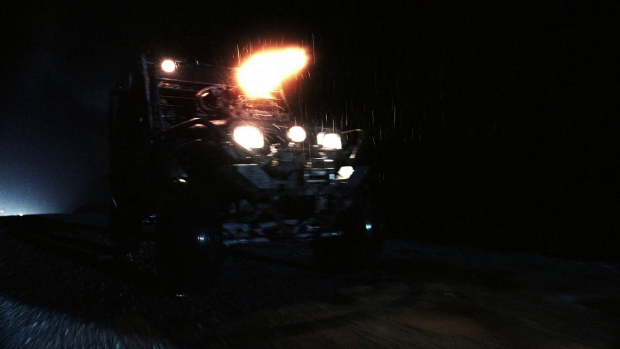 It allows for some great action which includes Murphy making a Scarface reference which makes me wonder how he knows about that film to reference it. I don’t think the show has ever addressed the preservation of pop culture so references like that while amusing feel out of place. Still, there are some entertaining sequences that are over briefly but clearly show the overall bleakness of the situation. Wonkru are hopelessly outnumbered and outgunned so it makes sense that it would be a short fight. The brevity of the conflict is telling as it proves to Octavia that her decision was a mistake even if she’s unwilling to admit it. Her conversation with Bellamy as they unconvincingly play dead is meant as an “I told you so” moment on the part of Bellamy. He tells her that the deaths in this battle are all her fault and she should definitely feel bad for forcing this choice on her people. Bellamy also points out that she has lost because many of her people are now dead and those who are still alive will no longer follow her. It might seem harsh but all Bellamy is doing is repeating what he has been saying all along only with brutal evidence to back it up. Octavia and Bellamy’s relationship is certainly a complicated one this season because they feel bound to familial obligation but are very much on opposite sides of key issues. At this point they are more antagonistic than anything else as shown by Bellamy chastising her for her wrongheaded decisions and admitting to her that he wishes she was dead. The latter may be intended to shock her into making more reasonable decisions but there’s an honesty to Bob Morley’s line delivery that makes it come across as being completely genuine. Marie Avgeropoulos shocked and pained facial expression in responses clearly shows that Octavia wasn’t expecting to hear that and is hurt by Bellamy’s admission. Gaia being badly wounded and near death is another clear example of how big a mistake this attack was. It is made clear that many of Octavia’s people have been killed but from an audience point of view it’s more of a shocking statistic than anything meaningful in terms of progressing Octavia’s character arc. Gaia being injured is a great way to raise the stakes and make the losses feel more personal. 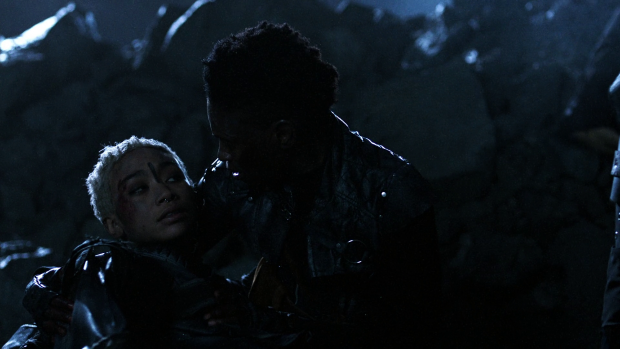 Indra cradling her biological daughter as she clings to life is a harrowing image and clearly affects Octavia because of the connection she has with Indra. Indra’s grief is handled really well. It’s very moving to see her reassure Gaia by pointing out that there is hope in the form of a new commander and doing what she can to make sure she fights to stay with her. Very little has been done with the mother/daughter connection between Indra and Gaia in favour of Indra’s relationship with Octavia. This makes sense as the Octavia/Indra connection is a core relationship for the show where Gaia is on the sidelines. Some work was done to explore how they relate to one another as daughters of Indra but on the whole Gaia has been a mainstay without much depth. The situation here works so well because Indra is so well developed and it’s easy to extrapolate how much she would care about Gaia when considering how close she is to Octavia. It’s clear that she considers Octavia a true daughter and she does show a lot of affection towards Gaia so the development of other characters is able to fill in the gaps here and make for a really moving moment of potential loss. Octavia knows that what has happened to Gaia and her people is her fault so also knows that what she does next will be a definitive moment for her. For what it’s worth she makes the best decision available to her in terms of protection what happens to be left for her people. She hears Bellamy say he wishes she were dead, sees the consequences of her decisions as far as Gaia is concerned as well as the impact it has on Indra emotionally so the only conclusion for Octavia is self sacrifice in favour of preserving what remains of Wonkru. Her next move is to act as a distraction while everyone else slips away because she asses that McReary’s people only want her. For a moment it looks like it will be the end for Octavia though she is saved at the last second by Madi. Thankfully her sacrifice still has meaning because she saw no other solution after her bad decisions had led them into a War that they had no chance of winning. Putting herself in the firing line to protect her people is a clear sign of taking responsibility for everything that has led to this moment and refusing to let her people be wiped out because of decisions she has made. Clarke isn’t as well handled in this episode. Her maternal instincts are being used to justify some really questionable actions especially where Madi is concerned. Madi is struggling to adapt to having the Flame inside her though it is changing her in the way it’s supposed to by giving her access to the knowledge of the Commanders and making her feel like part of an important lineage. This seems to be something that Clarke struggles to accept as she spends a lot of time trying to force her to part with the Flame because she thinks that Madi isn’t equipped to deal with it. In truth we don’t know enough about the Flame to make any assumptions about how easy the bonding process should be or what it actually does to someone. Lexa is the Commander we spent most time with and she always seemed very sure of herself so it’s a very different outlook than the one we attribute to Madi who is very much at the beginning of that process. As such it makes sense for her personality to be in flux and for her to struggle to deal with the influx of information along with emotion. Madi feels compelled to help with the War effort because generations of Commanders were committed to leading their people with strength and protecting them at any cost. Her own sense of self preservation has been stripped away in favour of self sacrificial tendencies when it comes to helping those she considers to be her responsibility. Clarke fears for Madi’s safety and takes advice on dealing with the problem from Abby who reminds her that she sent 100 kids to the surface of Earth to stop her daughter from being killed. Clarke concludes from this that it’s her responsibility as a mother to do whatever it takes to keep Madi safe even if that runs counter to what Madi wants. Clarke’s desire to keep Madi safe is very understandable as the show has built a strong foundation to their mother/daughter relationship. Where it falls down is that Clarke decided that she was fine with Madi accepting the Flame when it was to serve as a way to bring down Octavia but objects now that the Flame has the effect on her that was always known. This makes Clarke look really selfish as she only seems to be doing what she considers best for herself and appears to be using Madi to accomplish that. As soon as Madi doesn’t do what Clarke wants she takes it upon herself to attempt to force the issue which certainly doesn’t appear to be supporting Madi the way a mother should. Tricking her with affection before putting a shock collar on her and promptly using it to stop her leaving is the perfect example of how badly Clarke is being written here. It isn’t believable that she would harm Madi for what she thinks is her own good because it doesn’t gel with her willingness to put the Flame inside Madi in the first place. Seeing her activate the shock collar comes across as an empty unexpected twist intended to shock the audience. It basically makes Clarke look like an abusive parent who is only reasonable when her daughter behaves. Based on previous episodes we know that not to be true so it’s strange that the writers didn’t try to come up with a more interesting approach to Clarke being concerned about what Madi is becoming. There’s a bizarre subtext to this whole thing thanks to the presence of Lexa’s memories within Madi. They have a discussion about Commanders cutting themselves off from love with the exception of one. Experiencing Lexa’s feelings and memories is something the show has both leaned into and tried to sidestep. It’s definitely interesting to have Clarke faced with a representation of Lexa because they loved each other and Lexa was lost but having the mouthpiece for that be her daughter doesn’t feel quite right. It does work well for Madi who sees Clarke through Lexa’s eyes and focuses on her as a warrior which widens the gulf between them because Madi sees Clarke outside of that maternal light and starts to question her effectiveness as a parent especially when her actions could be interpreted as cowardly. Eventually, Clarke does decide to support Madi though it comes after she pulls a gun on Raven which feels really off considering it’s the first time they’ve seen each other in 6 years. With more work Clarke’s mindset could have made sense as the moments she shares with Abby work really well on an emotional level but they don’t exist in a vacuum and clash with everything that happens around them. I did like Madi’s excited reaction to meeting Raven after hearing about her in stories. Even though she is being flooded by memories and emotions there is still time for that childlike wonder. This episode does continue to develop McCreary as a frightening if 1 dimensional antagonist. If nothing else he seems fully committed to his campaign to force himself into a position of leadership and stamp out all resistance. He makes it clear that he will continue to fight Wonkru until there is nobody left and his approach to dealing with Diyoza is similarly heartless as he resolves to end her life once she has their baby. There isn’t much to say about him though he is an enemy that can unite pretty much everyone including Diyoza which may be the road to a truce if not actual peace. Kane finds himself in serious trouble when he comes across Vinson who isn’t happy that Kane has helped Abby come off her meds. He relied on their arrangement and doesn’t want to see that end so his reaction to that news is consistent with his behaviour in the previous episode. He proceeds to stab Kane a few times before taking a bite out of his neck before Abby uses his collar to kill him. It’s a really brutal sequence that further shows the consequences to Abby’s addiction. It has now indirectly led the man she loves to death’s door with her forced to consider the ramifications of her alliance with someone clearly who was clearly unhinged, unpredictable and dangerous. Kane’s fate is left ambiguous which adds to the anticipation of whether Abby will have to accept that her actions robbed her of Kane. A strong episode that handles the War story and how that relates to Octavia really well but drops the ball on Clarke’s characterisation. Framing the conflict as a hopeless one was a good idea as it highlights the mistakes that have been made by Octavia in leading them to this point. She now has to live with her decisions causing a significant number of her people to be killed. 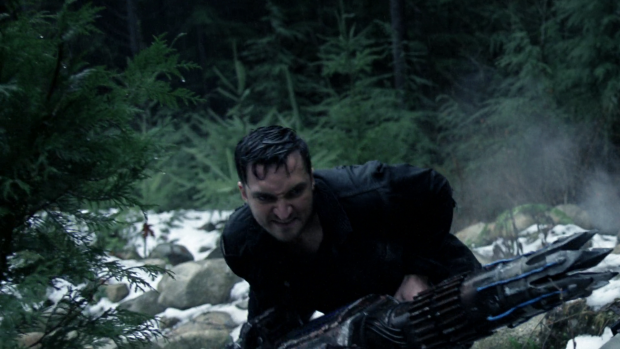 This is personified by Gaia being near death as Octavia is a bystander to Indra cradling her out of support. It makes good use of the mother/daughter connection between Indra and Octavia to extrapolate how serious the situation is combined with Bellamy calling her out for wrong headed decisions while wishing she was dead. 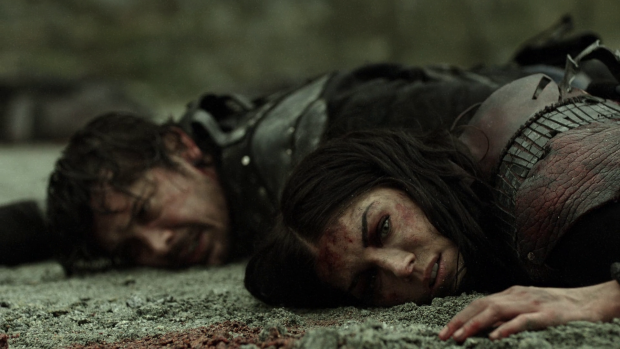 Octavia’s sacrificial moment is earned because it shows that she is willing to accept responsibility for everything she has done and let herself die with some dignity. She doesn’t die but the decision is still an impactful one. 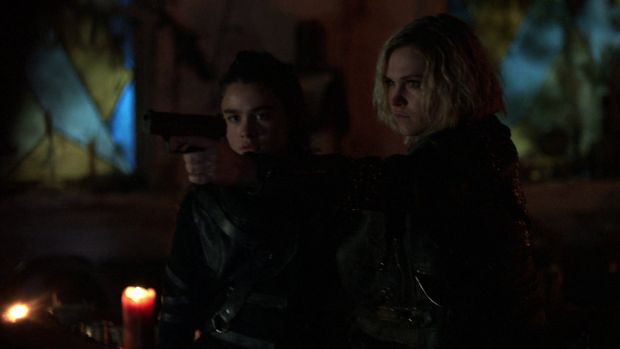 Clarke doesn’t fare quite as well as she is trying to control Madi after prompting her to accept the Flame previously. This comes after advice from Abby which works on its own as an emotional mother/daughter moment but in context of previous episodes as well as Clarke’s actions in this one it feels out of place. This makes Clarke look as if she only allowed the Flame to be installed for her own reasons and wants that taken away now that Madi is willing to put herself in danger. Clarke using the shock collar on her is played as an emotionally resonant twist but it really doesn’t work. Clarke pulling a gun on Raven the first time they see one another after 6 years also doesn’t work. It also makes Clarke’s eventual change of heart feel unearned as well. Madi changing as a result of bonding with the Flame is really well handled as there are a lot of inconsistencies to her behaviour because of her processing the foreign memories and emotions. Things like seeing Clarke in a different light through Lex’a eyes are somewhat concerning given the nature of their relationship but the different perspective is interesting by itself. McCreary may not have much to him but he is a frightening antagonist that can unite the characters next week in their efforts to bring him down. He’s cold, calculating and uncompromising while also being reckless and that makes him really dangerous. Kane coming across Vinson and being brutally stabbed as a chunk gets taken out of his neck is brutal and serves as a powerful reminder of the consequences of addiction that Abby is now dealing with. Leaving his fate uncertain until next week is a good idea as well.